I’ve been to a fair few trackdays over the years. Some of them have been pretty fancy affairs – from a near-empty Mugello riding the litre V-twins of the time, to a winter blast round a quiet Valencia when it was snowing back home. Sepang, Eastern Creek, Catalunya, Spa, Salzburgring: I’ve had a taste of some incredible tracks. So how would a coned-off circuit on a working RAF base compare? 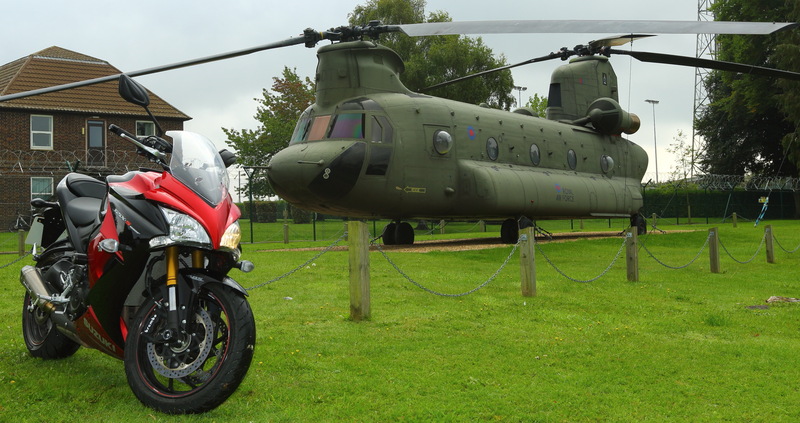 Well, I got the chance to find out towards the end of last year, when an old mate, Sgt Damo ‘Scotty’ Scott invited me to the Airfield Riding Day at RAF Odiham, in Hampshire. Odiham is the main base for much of the UK’s helicopter force, in particular the twin-rotor Chinooks that thump their way around the south of England (when they’re not thumping their way round the troublespots of the world). But for three days a year, it stops being just a chopper base, and hosts a well-organised motorcycle riding event. Odiham’s runway is transformed into a rather good two-mile long circuit, with a half-mile straight, and some nadgery bends. It’s not even completely flat, with some changes in elevation as you go round the outer taxiways and access roads. 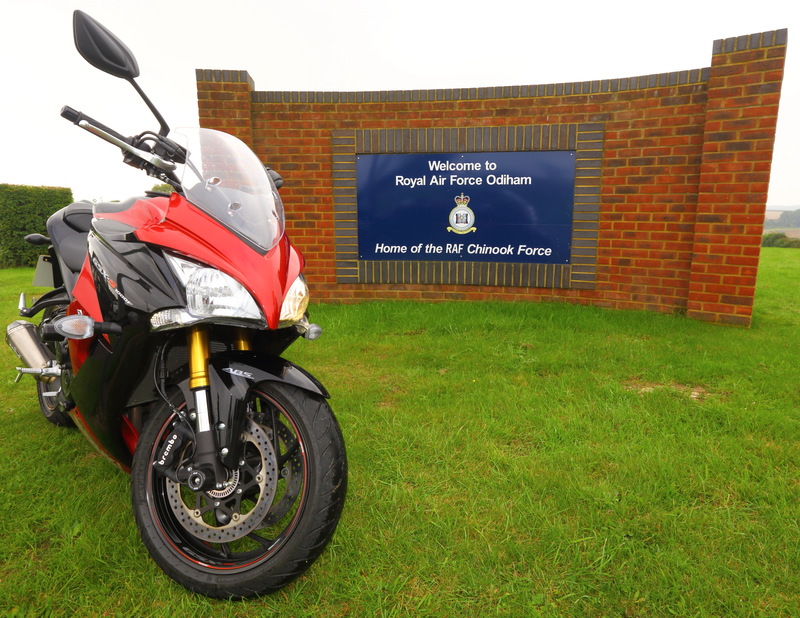 The fact that Odiham is a helicopter base is a real advantage: since the runway isn’t in use for fixed wing planes, the club is able to make more use of it as part of the riding days. 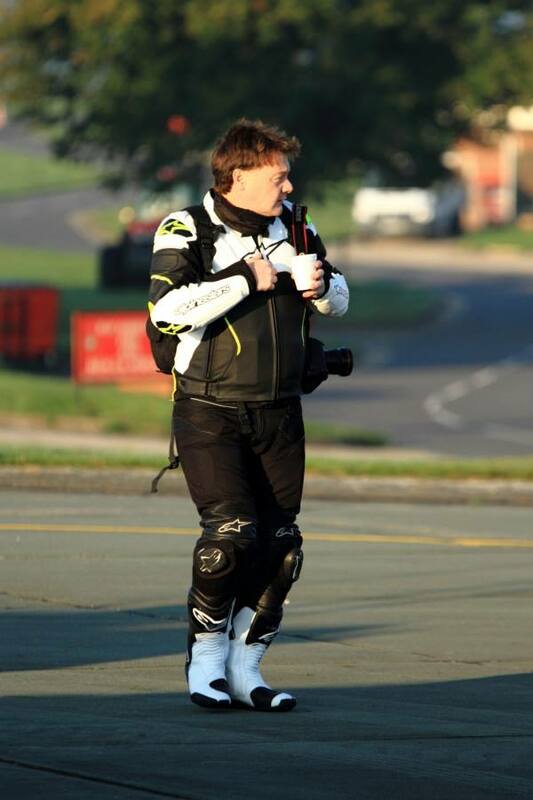 You’ll note I say riding day, rather than trackday. That’s an important distinction for the club: this isn’t a racetrack, so by definition they can’t run a trackday there. 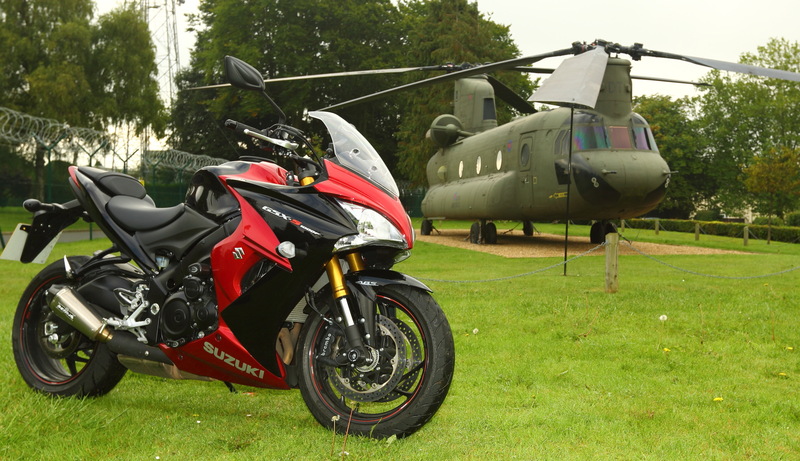 Rather, the club organises ‘riding days’ at the airfield, where members can explore their bike’s capabilities, in a safe environment, away from the road. I turned up on my GSX-S1000 F, on a fresh, chilly September Sunday. Odiham is about an hour from the M25, and I had to be here for 8am, so it had been an early start. But the big Suzuki crunches miles with aplomb, and I turned up at the gatehouse in plenty of time. I was surprised at how many people I passed en route, who were clearly also on their way to Odiham. It was like a normal trackday crowd: bikes on trailers, slightly shabby Transit vans with ‘Rossi 46’ stickers, and riders on sportsbikes with full leathers. All heading for the base. That scotched my first misapprehension: that the Odiham club was just for forces folk. In fact, it’s a civilian organisation, with the majority of members from outside the RAF. 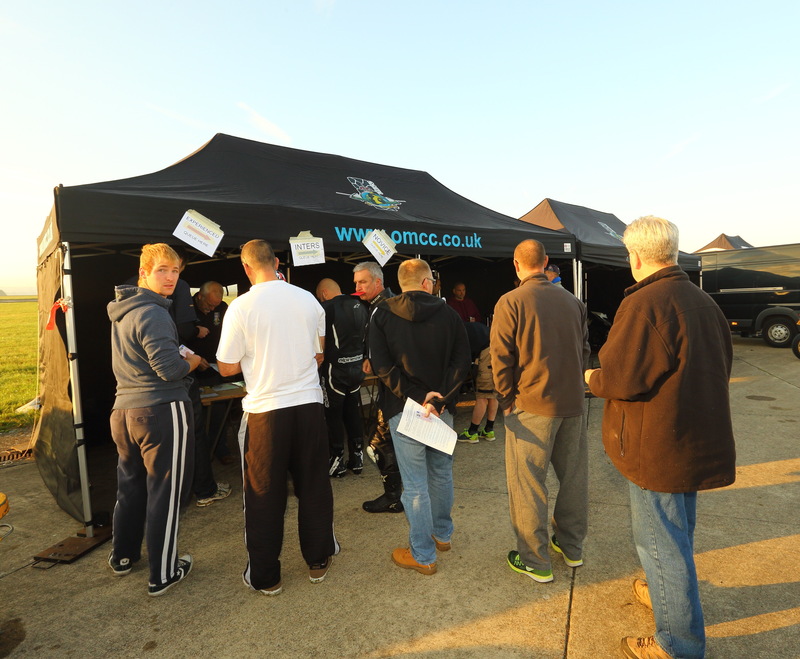 But the base and the club committee work to share the base resource – the airfield and riding course – with the local motorcycling community. Once I’d had an ID check, I was guided to the ‘paddock’: a sectioned-off part of the base, which looked for all the world like any other trackday or club-race paddock. Vans, trucks, trailers and caravans were lined up, with some potent-looking bikes sat on stands, generators whirring away, powering the tyre warmers. Suddenly, my chunky-looking roadbike, with mirrors, lights and number plate looked a bit amateur… I wasn’t the only one on a road bike though: there were plenty of riders on non-track bikes, and even the odd classic machine ready to go. Chief tehnician Dale Johnson, the event organiser, Sqn Leader Doug Fowler (instructor) and Ian Davidson (chief instructor) were on hand to point me towards the coffee, answer my daft questions, and then point me towards the signing-on point. And it was time for the briefing. Again, the level of professionalism was on a par with the best I’ve seen. 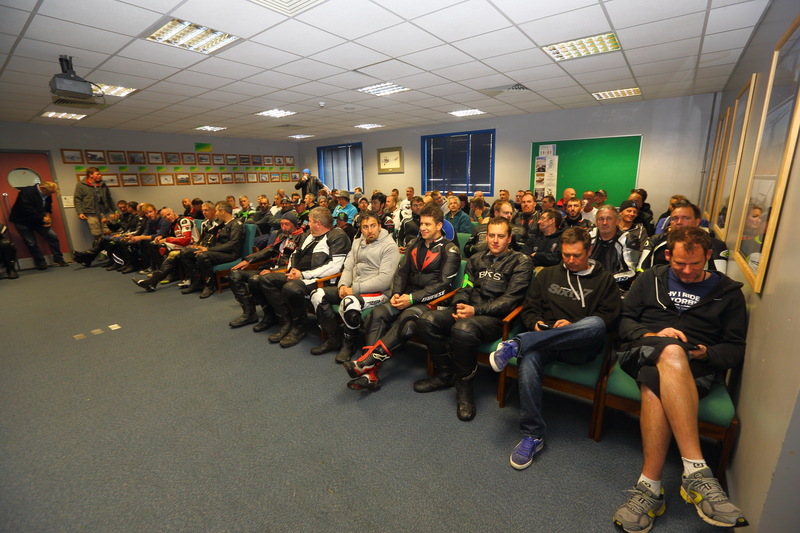 The organisers got the message across about safety and consideration for other riders, without preaching or hectoring. Wristband on, and we were all set for the first riding session, in the ‘advanced’ (not ‘fast’) group. The first sighting laps of the day are always welcome, even on a familiar track. So on this totally unknown circuit, they were a godsend. The Odiham layout, like any other airfield circuit, has an enormous straight. A proper kilometre long, I’m later told, and it lets you properly stretch the legs, even on a litre bike. After the straight there’s a tight right-hander, with loads of yellow painted markings for aircraft movements, then a short straight to a chicane. Out the back, the track takes in various taxiways and access roads, but the layout is well-thought-out, and the changes in surface are more than manageable. 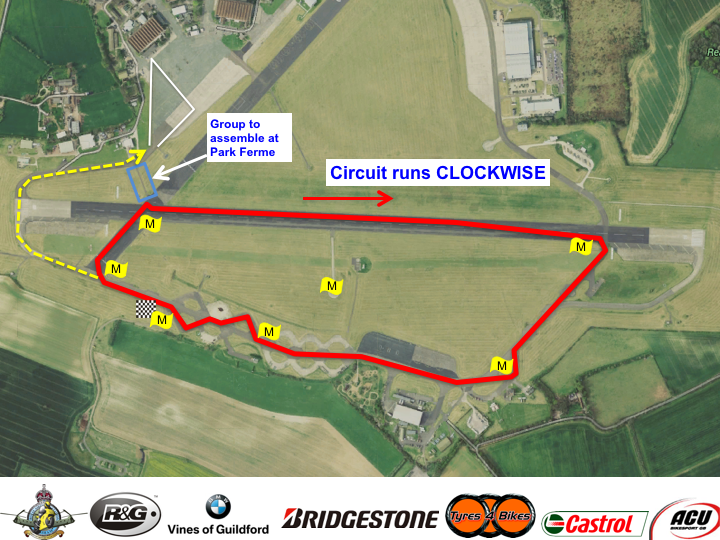 Then it’s back across the main runway, round the bottom bend, and through a first-gear hairpin before you hit the gas hard onto the main straight again. It’s a surprisingly intricate layout, with much more to it than somewhere like Bruntingthorpe, but it’s also pretty easy to learn. The gradient changes on the access roads add depth to the setup, and it’s far from the ‘coned-off circuit in an enormous car park’ you might expect from an airfield track. Sighting laps – very welcome on a new track..
First session is over, and I’m quite pleased. First of all, I’ve not chucked the GSX-S away in a huge fireball of destruction. I’ve not crashed into any £50million helicopters. And I’ve not had any irate RAF policemen chastising me at gunpoint for misbehaviour. I’m pleased with the big Suzuki too. This is the first time I’ve had her out on track, and it’s going well. The first session is always a steady one, but with the traction control and ABS safety nets there, I’m able to concentrate on learning the circuit. I’ve not been on track a lot myself this year either, so I’m essentially riding round corners like my gran (who’s been dead for nearly thirty years…) Plenty of folk are whizzing past me, including a warp-speed James Hillier, who’s turned up with the Bournemouth Kawasaki team for a bit of a rideout. But when we get to the enormous straight, the beefy GSX-S catches a few folk out, putting down its 145-odd bhp in a grunty roar. It’s fast, no doubt, and while it’s a step below the ZX-10Rs and S1000RRs that are perambulating round, it quickly reels in track-spec 600s, 750s and even litre twins. Next session, and I’m picking up speed. One of the instructors gives me a tow round, helping get the lines clearer in my head. It’s mostly straightforward though, and once you work out where you’re going, the improvements come quickly. I’m still a little nervous at certain points though. Turn one at the end of the straight has me in a quandary. There’s an enormous box of yellow paint, and with the cool temperatures, and a hint of dew on the shiny surface, I’m reluctant to give it full beans until I’m away from the paint. 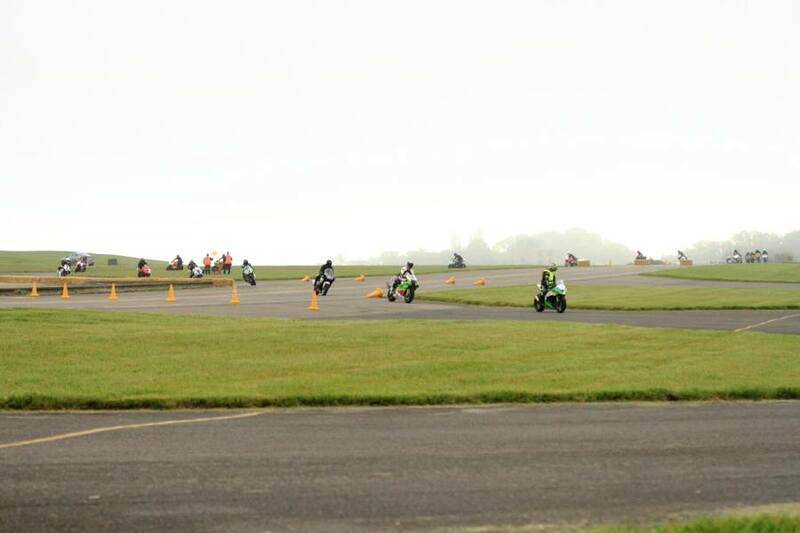 Each lap I’m convinced I’m about to come a cropper, until all I can think about is that bloody yellow box! By my final session though, I’ve developed a coping mechanism: turn a bit later so I avoid the box altogether. And now we’re up to full ramming speed, the GSX-S shows a little bit of its road roots. The pegs are touching down a bit now, nothing horrendous, but they scrape at modest lean compared with a proper sportsbike. And the ABS has been a bit confused once or twice. There’s one bend where you’re hard on the brakes over a couple of ripples. The brakes are fine if you’re on them well before the ripples, but once or twice I brake a bit later, and it seemed like if I slammed the anchors on hard just as I hit the bumps, the ABS had a heart attack, and dropped the pressure off. Nothing terminal, and certainly nowhere near the bad old ABS systems of old. But a worthy reminder that roadbike ABS systems can meet their limits once you start to push things on a track. And we’re done. Of course, the best bit about riding a road bike to a track day is how quickly you’re away. I stuck the tankbag and tailpack on the GSX-S, said cheerio, and was on my way in minutes. 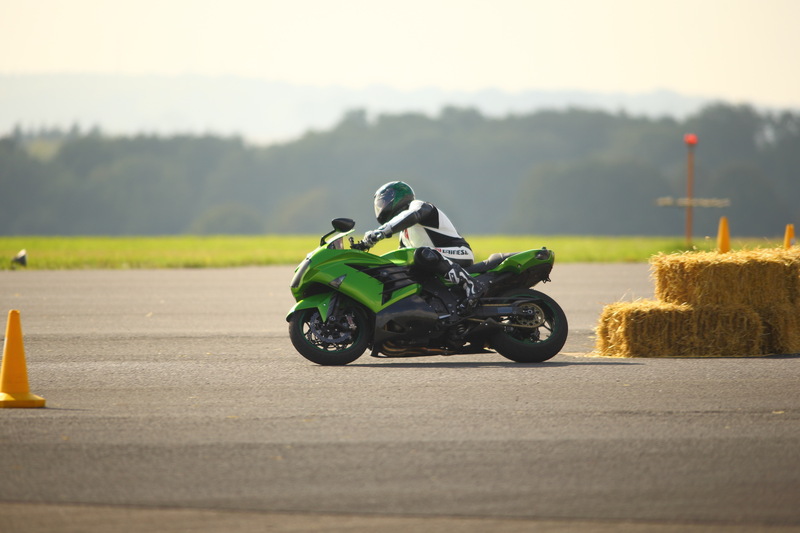 A top day – and well worth considering if you’re in the Hampshire area, and looking for a riding day with a difference.